Which cabling infrastructure is right for your wireless network? When installing cabling for a wireless network, what is the best cabling infrastructure? 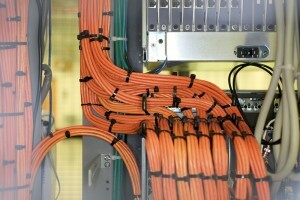 The wrong cabling infrastructure can pose several problems and inefficiencies. When it comes to wireless cabling infrastructure, there are several solutions. These include coaxial cabling, optical cabling, and Category 6 or Category 6A cabling. But which solution is the best? Enterprise WiFi systems: These wireless networks typically utilize balanced twisted-pair cabling such as Category 6 or Category 6A. Distributed antenna systems (DAS): These networks are for wireless mobile phone coverage and may utilize coaxial cabling, Category 6/6A, or fiber cabling. Small cell systems: These networks are better suited for providing wireless coverage in smaller facilities (50,000 square feet or less). Small cells connect with Category 5e or fiber. Ultimately, the best cabling infrastructure choice will be dictated by the type of wireless network being installed. You may have a choice between two different cabling types; many people will often see that their wireless networks and their data networks can both be installed with the same type of cabling infrastructure, such as Category 6/6A or fiber. However, this poses several problems, which we’ll cover in our next post. This entry was posted on Friday, May 5th, 2017	at 7:10 pm	. You can follow any responses to this entry through the RSS 2.0 feed. Both comments and pings are currently closed.